Jennie Miller – Tudor, Pickering, Holt & Co.
Jennie Miller serves as Counsel for the Firm. 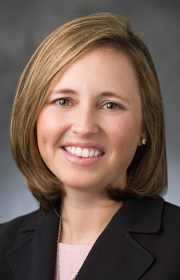 Miller was previously a corporate attorney at Andrews Kurth Kenyon LLP, where she focused on private equity, M&A and capital markets deals in the energy industry. Miller holds a BS in Applied Mathematics with a minor in Systems Engineering from The University of Virginia and a JD/BCL from Louisiana State University Paul M. Hebert Law Center.